Jeremy's notes: A fast paced game that plays incredibly well as a solo game as well as a larger multiplayer experience. In addition, the games many modes including Competitive, Cooperative and Team all feel like natural parts of the games design, and not a tacked on afterthought. The box art for this game is not your typical Flying Frog photo collage. The artwork is all hand drawn and certainly has a different style than what we’re all used to. I would even go so far as to call the style “rough” as it often resembles artwork from the 50′s, if a highschooler was doodling in a notebook after reading his favorite pulp sci-fi comic. Also, there are not a lot of plastic bits shown on the box, which is not what I’m used to being served by Flying Frog. I had, for the most part, dismissed this one altogether. I was coereced into giving it a try with a group I play games with on Tuesday nights. I was assured that it would not take long to play so if I did not like it, I wouldn’t have to endure it for long. We played a three-player game that moved right along, but too fast. After a couple of games, I’ve got to admit that I really have flip-flopped on this one. 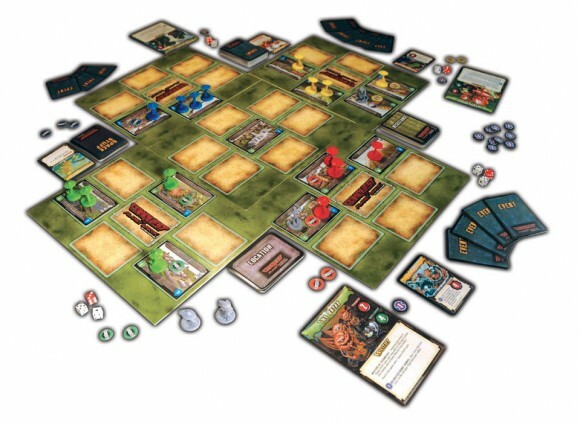 I had a great time and Conquest is now on my must-buy list. It is a simple game that allowed me to become a real contender on my second turn, which I appreciate. I don’t mind having my lunch handed to me the first time I play a game, but the rules were clear and a lot of useful information is provided on the guide cards. If you like the theme, can forgive the rough artwork, and don’t mind an easy to pick up and play game, give this game another look. This game is just fun. If you find the theme even a little bit appealing I think this is a can’t miss. Co-op is by far the better option. We’ve only played the standard rules twice but have played the cop-op game a bunch. It plays fast and is silly enough to feel very light but has enough tough choices to keep it interesting. The artwork is cool and really brings the theme to life. My favorite from Flying Frog so far. A few of the races are kind of broken or under/overpowered right out of the box but with so many to choose from its not a big deal. Hopefully we’ll see this corrected with an expansion. 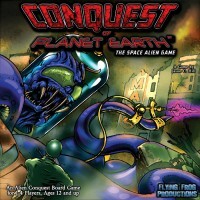 Add a Review for "Conquest of Planet Earth"